It was supposed to be for just one night: a night of celebration and a night to thank all the ranch women who had paid $100 to have their family’s brand painted on a fibreglass cow, Brandy. That one night was nearly two decades ago, and on May 5, the Cowgirl Cattle Company plans to celebrate its 20th year with the annual Rendezvous at the Madden Community Hall in Madden, Alta. Jill Richards, who along with her sister, Judy MacKenzie, started the Cowgirl Cattle Company, recalled how the event began with an idea for a single event to thank the women who put their brand on and donated money. Brandy the fibreglass cow was originally bought by the ranching sisters for $5,000 during the Udderly Art campaign in Calgary with the idea to raise money for the now defunct Western Heritage Centre in Cochrane, Alta., by persuading other ranching women to donate money and have their brands painted on the cow. 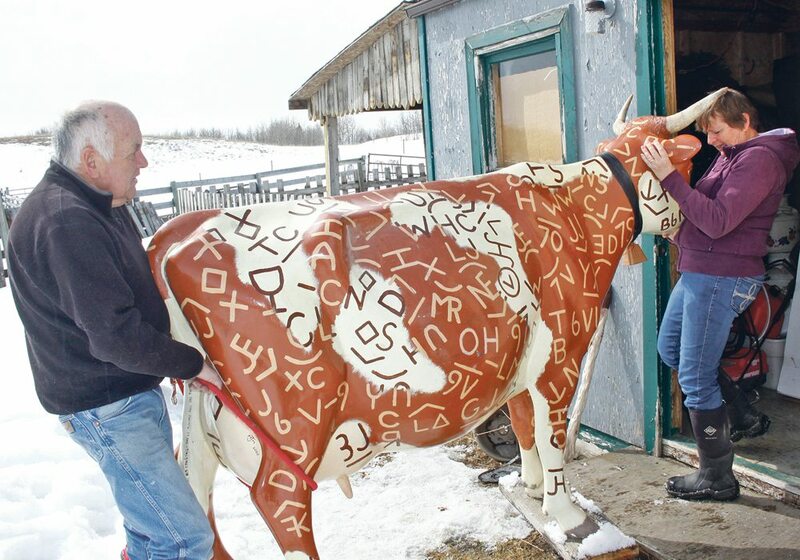 MacKenzie’s late husband, artist Malcolm MacKenzie, painted 165 brands on the cow and they then donated the money to the Western Heritage Centre. “At that time, it was only for women who had registered cattle brands,” Richards said. It was good that the branding restriction was lifted because Brandy ran out of room years ago and another fibreglass cow, Charity, had to be purchased to accommodate another 100 plus brands. Ranchers/artists Dixie and Shirley Edge painted the brands on Charity. Both cows are the centrepieces at the annual Rendezvous, a night that features a five-course beef meal, entertainment from the Stoney Pow Wow Dancers, silent and live auctions including a log bed made by Doug Richards and a western painting created by Danita Phelan. Throughout the years, the Cowgirl Cattle Company has raised and donated almost $250,000 to various charities. This year a good portion of the money raised will be donated to the Calgary Firefighters Burn Treatment Society. During the first 10 years, the event was held in Cochrane, but it has since moved to several different communities in southern Alberta. Women interested in attending the event can buy tickets through the website at www.cowgirlcattlecompany.com. Tickets cost $100 each or a table of eight can be purchased for $750.